I feel like Monday needs a good sandwich. And I am going to be honest, I still have not a clue how to say Bahh Mi. The way I pronounce it would make you laugh and possibly make you look at me like I am crazy, my mom totally did. But it’s a darn good sandwich and since it’s now officially spring and all, I thought I would switch up the traditional pork with some fish. It just sounded kind of good and I had some frozen mahi mahi fillets in the freezer that have been begging me to do something with them for too long. Oh, and you know how yesterday I showed you guys all the photos of the barn? Remember how it was crazy snowing? Well, I am very (VERY) happy to say that Sunday was a picture perfect spring day. Probably a little colder than most are used to, but it was a bluebird day (a beautiful sunny day after an overnight snowfall. It’s a perfect skiing/hiking/just about anything day with a clear blue sky, bright sun, and fresh snow). And inside the house it almost felt like summer. Ahh!! This excites me greatly. I know it’s gonna snow again and keep on going to the very, very end of May, but it is a sign of good things to come! Speaking of Sunday and my Barn post, I cannot believe the amazing comments you guys left. AND I have only gotten through a handful of them. Well, I skimmed them all, but have not had time to respond yet. Actually I am super behind on all comments…trying to catch up today. Anyway, you guys have me so excited to share the process with you. I will do my best to document it all. Since it’s Monday though, let’s talk about these sandwiches and ease into the week with more pictures and a little less words. Words require thoughts, and on Monday that’s just kind of hard. Or it is for me anyway. 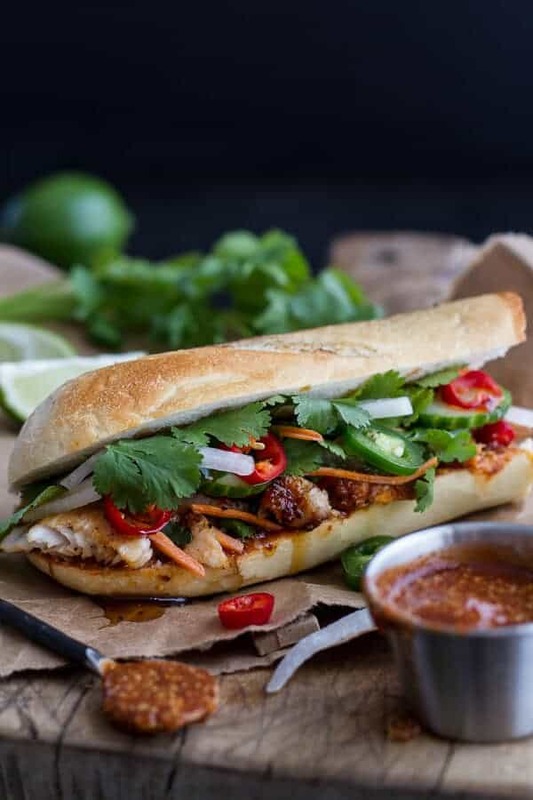 If you are unfamiliar with a Banh Mi it’s a classic Vietnamese sandwich that was actually introduced by the French, hence the french baguette. Or that’s what Google said, but it makes sense. I typically see these made with some kind of caramelized pork, so I swapped the pork for fish and made some spicy sauces to slather on top. I have always hated mayo, so I was super nervous about my curried mayo idea – I made two sauces just in case. One I knew I would like and one I wanted to try, but I needed to have a back up in case it was horrible. Turns out I loved them both. Why does this happen when I am prepared with a back up, but I hate the ones I have no back up for? Does that make sense? I am not sure Monday is my friend right now. Ok, but the real reason for this sandwich? The fried eggs. This meal was built around eggs. If you are not a fan of the runny yolk, hard-boiled works too. But you must make the eggs. They complete the sandwich. In a heavy-bottomed small saucepan, combine the sugar, lime juice and water and bring to a boil. Boil undisturbed over moderately low heat until a deep amber caramel forms, about 5 minutes. Stir in the minced red fresno pepper and pinch of pepper. Remove the saucepan from the heat and carefully whisk in the fish sauce and 2 tablespoons of water. Stir over moderate heat until the caramel is smooth, sticky and slightly thick. Pour the sauce into a heatproof bowl and set aside. The sauce can also be saved for later and refrigerated. If the sauce is too thick add a tablespoon of water to thin and warm in the microwave on 10 second intervals. Heat the grill, grill pan or large frying pan to medium-high heat. In a small bowl combine the sesame oil and 1 tablespoon thai red curry paste. Brush the mixture over the mahi mahi. Grill or pan fry for 3 to 4 minutes per side. Remove, peel the skin away, chop into chunks and then drizzle with1 tablespoon of caramel. To make the spicy curried mayo, mix together the mayo and thai red curry paste in a small bowl. Cover and refrigerate until ready to use. To make the Siracha Mustard, mix together the mustard and Siracha in a small bowl. Cover and refrigerate until read to use. 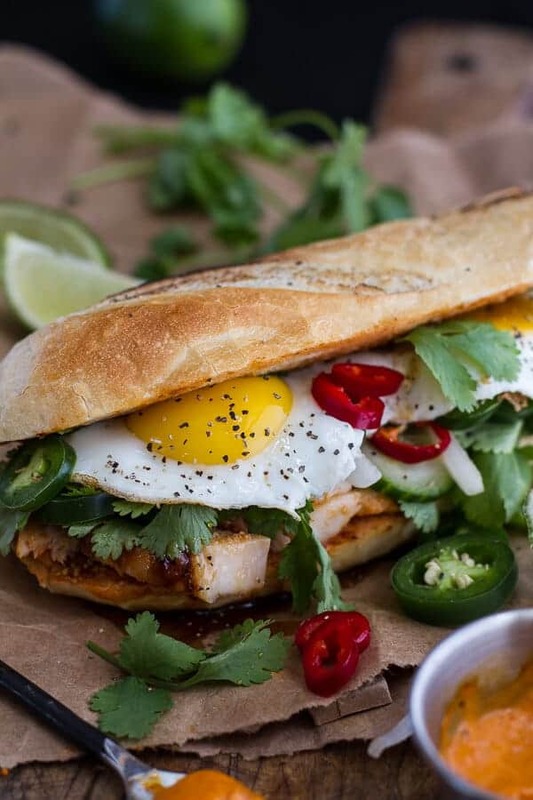 *Siracha Mustard from [Heather Christo | http://heatherchristo.com/cooks/2013/09/08/bahn-mi-sandwich/] and the caramel sauce is sort of adapted from [here | http://www.foodandwine.com/recipes/fish-sauce-caramel], eggs inspired from [White on Rice Couple | http://whiteonricecouple.com/recipes/fried-egg-banh-mi/] *To quickly pickle the carrots and daikon, sprinkle 1/2 teaspoon sugar and 1/2 teaspoon salt over the them. Allow them to sit at room temperature for 30 minutes. Carbs – they kind of make Monday better too. It’s a good balance. 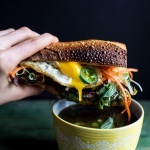 Short Rib Pho French Dip Banh Mi with Thai Basil Chimichurri. 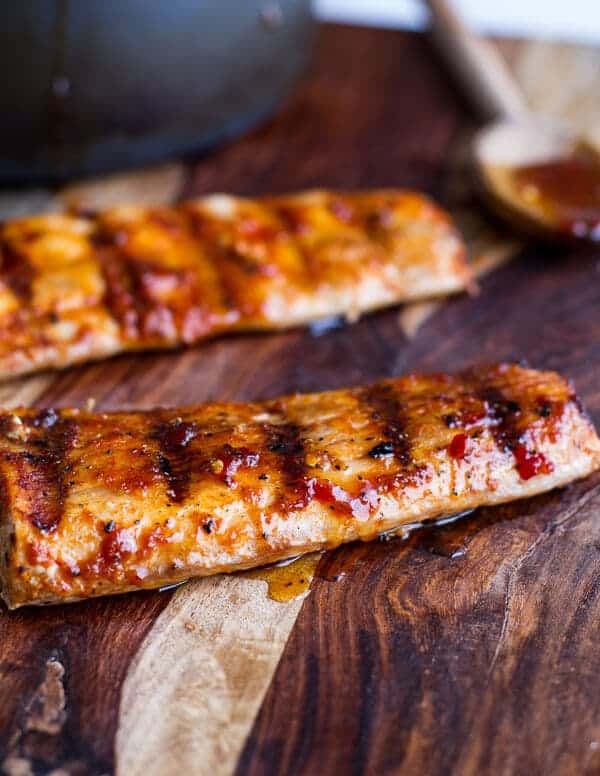 I happen to have a billion fillets of Mahi Mahi in my freezer and am getting a little bored of eating it plain and baked…this looks delicious. Anytime you add carbs and a runny egg yolk to anything, it wins! Haha! I so agree! Thanks Taylor! No way of any form could I handle the egg. My husband would love the fish I am sure. I don’t do fish either. Haha!!! It is a pretty colorful sandwich though minus the egg. HAHA!! Haha! If you want you can sub the fish for chicken, pork or steak. That is what I did for the fish heaters. Ha! You REALLY need to open up a restaurant, Tieghan! 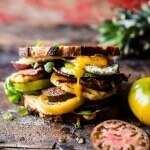 This is the most beautiful sandwich ever! Your eggs are total perfection! And I would have NO clue how to pronounce that either hah! 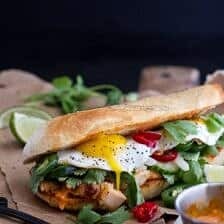 Banh Mi is my all-time favorite sandwich and I absolutely love the twist you added to it. And the fried egg?? Total perfection – love, love, love this!! Tieghan! This is wonderful. Every. Last. Bite. Thanks so much, Brenda! Hope you have a great week! OMG! Love this sandwich, girl! And the egg? Perfection. Love banh mi- first discovered it on food network and there has been no looking back. This sandwich is gorgeous. Pinned. Your cooking and pics are Pure Artistry! That is quite a sandwich! The eggs and the glaze on the fish have me sold! = ) Happy Monday!! 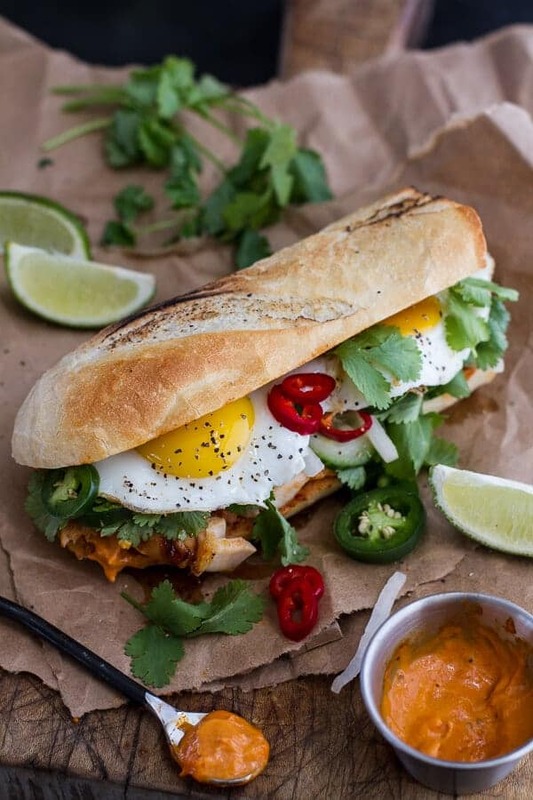 That is a perfect sandwich, spicy, sweet, salty, crunchy oh my! I didn’t read your barn post, but I’m so excited, I’m going to do so RIGHT NOW! 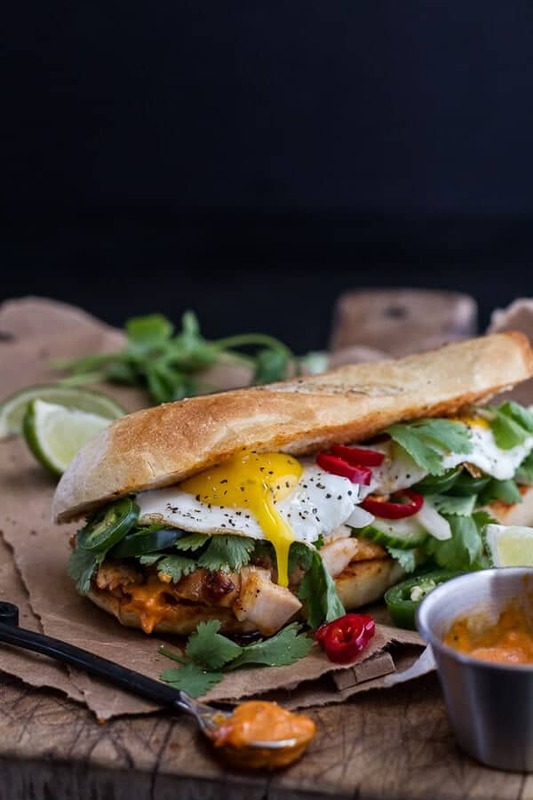 Confession: I’ve never had Banh Mi anything and don’t even know where to begin for pronunciation, but this thing looks amazing! I LOVE the fish! MMM! Alright, off to read your barn post! This is a pretty killer sandwich! I’ve been wanting to make bahn mi forever! And someone was just telling me about how amazing mayo + red curry paste is! Oh my gosh, I looooove bahn mis and this one looks to-die-for! I need it in my life. 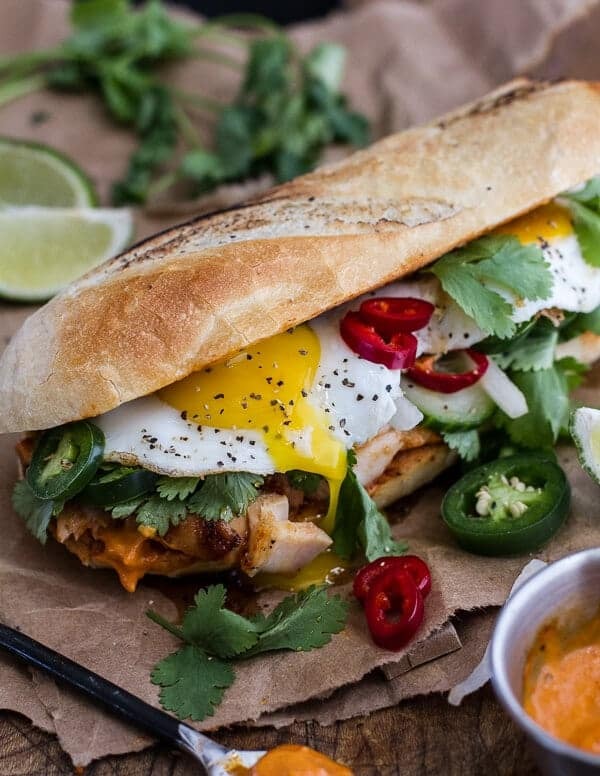 stop torturing me with these beautiful bahn mi..oh god that bread and fried eggs. About that barn pictures, i could not comment on it for some reason but its looking wonderful already. I am so excited for you 🙂 you are truly an inspiration! Thanks Dixya! You are so sweet! Sorry you could not comment, I will look into that! 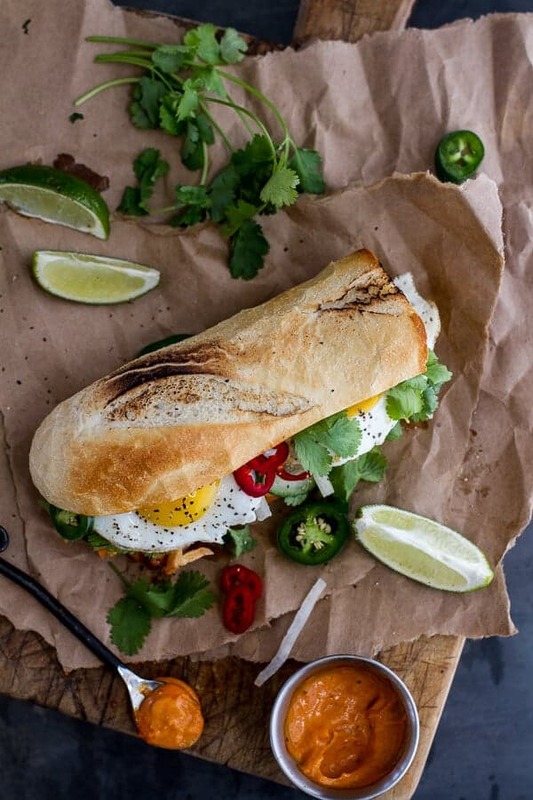 I’ve never tried banh mi but this looks like quite a sandwich! You must try it. You can customize it to your own taste! Holy crap that just isn’t even cool….that looks spectacular…SPECTACULAR!! Bahn Mi is one of my favorites like, of all time, totally. And the egg? Well that just pushed me over the edge. egg. I will have to swap my usual soft cheese with this yummy sounding mayo. No way! 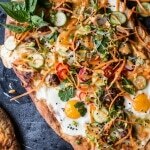 That is so cool and I never knew the Banh Mi was eaten for breakfast! Sounds awesome! 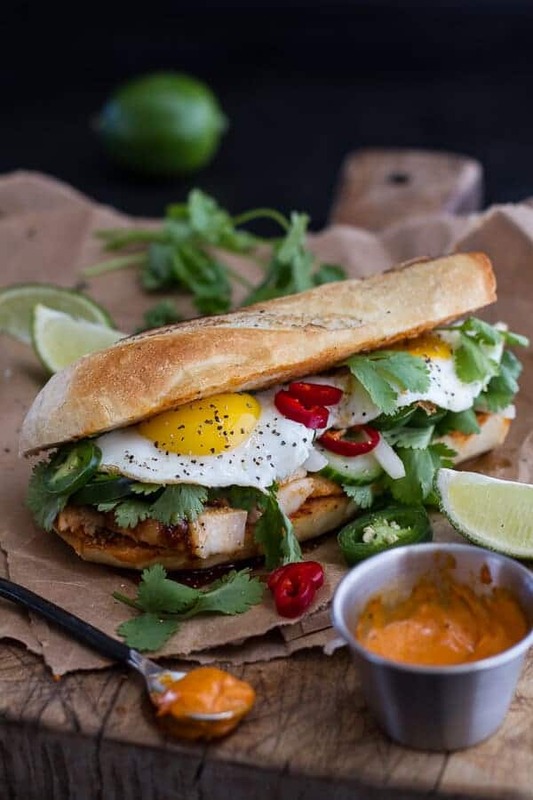 I need to eat a Banh Mi sandwich pronto! These photos are incredible! I’m really drawn by the runny yolks. Wow, your photos are absolutely fantastic! 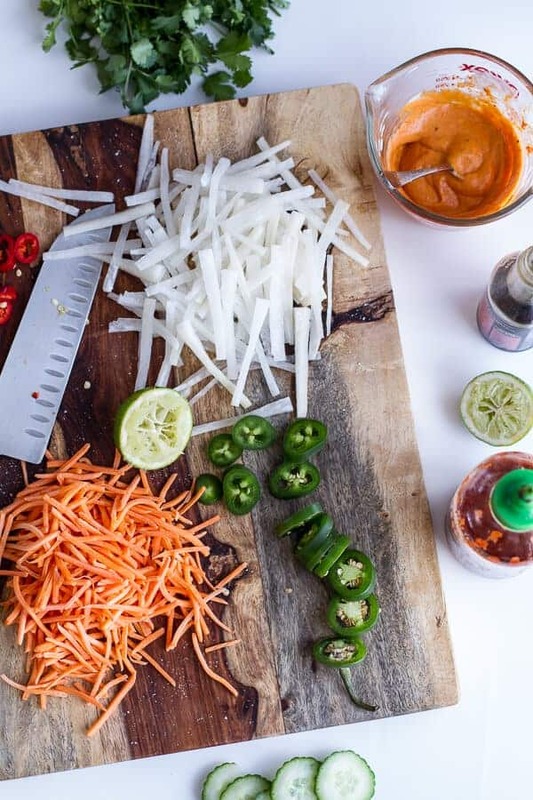 And how do you say bahn mi exactly? How weird could it be? Maybe I’ve been pronouncing it wrong, too. If that doesn’t make any sense, hopefully I’ll see you at Blog Her Food and I can teach you how to say all the different Viet words lol. Thanks for the heads up, Lisa!! I will fix those!! Still thinking about Blog Her, but I hope to get there! This looks incredible. We have a place near us that sells amazing banh mi for $4 a pop, so it’s always hard to justify making our own, but this one is definitely a bit outside the regular banh mi box and worth it. It is worth it, but man you are lucky! I bet those sandwiches are awesome! Just made this for dinner and OH MY GOD was it delicious! Way better than my $120 dinner last night! YA! So happy you loved this! Thanks! Thank you so much, Maggie!! Hope you have a great week too! 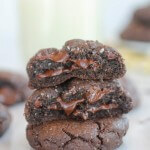 This looks delicious, great pictures also! the most amazing and different sandwich I have ever seen! Loved it. Congratulations! Eu estou tão feliz! Obrigado! Very good! Thank you for sharing!!! I am glad you enjoyed this! Thank you Vera! Look at this mayo and the eggs yolk!! Thank you!! YES carbs make everyday better! Haha! Hi, I am making this now and your instructions for making the caramel say to add garlic, I do not see garlic in the ingredients. I am going to add a crushed clove of garlic but can you tell me how much garlic you actually call for? I loved! I wanna make this recipe here. Tks for share. Delicious! I’ll do it for sure! Thank you!